Our flight from Bali to Yogyakarta was uneventful and we were met at the airport by our local guide Kodar and his driver Anton who whisked us of to our hotel, The Phoenix a colonial, heritage oasis in a hectic city. We were served drinks and sweet cakes and pastries while we checked in and then shown to our room overlooking the pool. That evening we ate in the hotels courtyard restaurant which proved to be very good and very cheap! I’m sure if we had gone out to a local restaurant it would have been even cheaper but how could we resist 5* luxury and food at £5 for a main course? We decided to order a Phoenix Sling, their version of the gin sling, the house cocktail (£6), to our surprise the bar tender was despatched to our table where she set up a temporary bar to mix the drinks in front of us, so we got a floor show with the cocktail – bargain! The food was excellent and we rounded of the meal with a scoop of coffee ice cream (me) and a sample selection of seven deserts (Mark). Yogya was looking good. After a good night’s sleep we were picked up for our first excursion with Kodar and Anton. Yogya isn’t a main tourist hub but it is the access point for two remarkable C9th Temples, Prambanan and Borobodur. Both temples are huge but were destroyed by an earthquake shortly after they were built and lay buried under ash and mud until rediscovered as piles of rubble in the 1800’s. Remarkably the Indonesian government, latterly with UNESCO support, have undertaken to rebuild the temples, they must be the world’s biggest jigsaw puzzles. 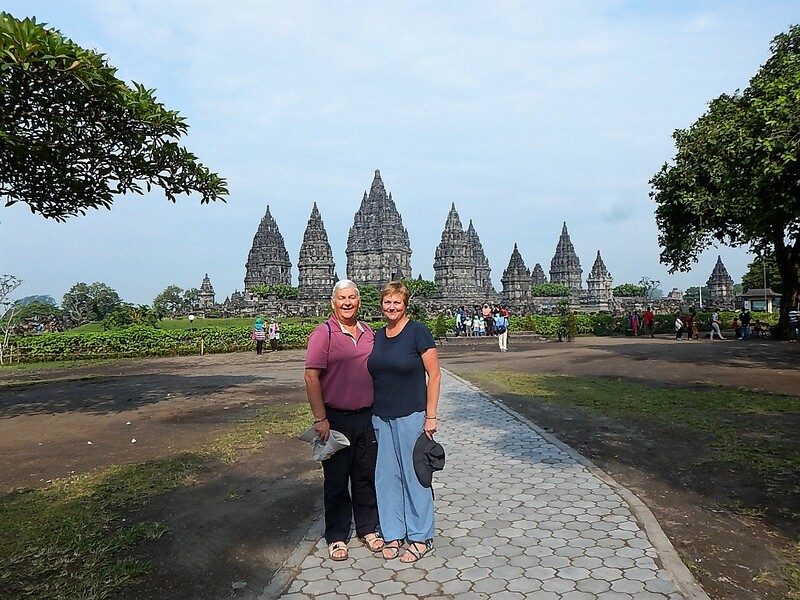 Our first visit was to Prambanan, about 30 minutes outside Yogya, the complex has 237 Hindu temples within it of which 90 odd are available to view. After walking around the site and enjoying Kodar’s explanations we visited four of the main temples in the central compound the largest of which is 47m tall and dedicated to Shiva, there is a large statue of the god inside the temple. It was remarkable to imaging this figure lying hidden for hundreds of years, and now being seen by thousands of people every year. Not far from Prambanan there was a large Buddhist Temple reflecting the period of transition from Buddhism to Hinduism at the time the Temples were being built. From Prambanan we drove back into the Yogya old town and were given a guided tour of the Sultans palace; the Palace plays an important role perpetuating traditional Javanese customs and is still home to the Sultan and his family. As Sultan of Central Java Province, the Sultan acts as Provincial Governor, he has five daughters and there is much debate about who will inherit the titles, his brother or his eldest daughter. We were shown round the palace by one of the Sultans servants. Next stop was the bird market, our travel agents had warned us that this might not be a comfortable place to visit but it is an important part of Yogyakarta’s cultural life so we did have a quick look. Apparently most Javanese households keep song birds, it is a way of fulfilling a religious obligation about caring. There is also a thriving bird song competition where people enter their birds in public singing competitions which are very popular and very competitive. Winning birds progress through rounds of competitions throughout the year with the very best competing in an annual grand finale. There is big prize money to be won and prize winning birds and even their eggs change hands for large sums of money. All that said, it was sad to see thousands of beautiful birds in cages up for sale, many are caught in the wild by farmers and then sold at the market, we saw all sorts including young owls who looked very forlorn. Beyond the bird market was a more general animal market where we saw tropical fish, kittens and puppies, bats and lizards all up for sale. One stall was selling chicken chicks which had been died bright yellow, pink and purple to attract children who then pester their parents. We didn’t stay long and were happy to cross over the road to visit the flower market. Back at the hotel we took advantage of the swimming pool and generally relaxed after a busy morning. Our second day in Yogya was spent visiting Borobodur about an hour’s drive from the city. We thought Prambanan was big, nothing prepared us for Borobodur. The temple is approached though gardens and the tall trees shield the view of the building then as we turned a corner the huge temple came into view. It is the biggest Buddhist Temple in SE Asia, built on three levels it is accessed via flights of stairs which lead up over three terraces representing earth, an intermediate state and heaven. Kodar led us around each level in turn deciphering the carved panels as we went, some told the story of Buddha, others told fables, they were all beautifully carved and very well preserved. One whole layer of reliefs on the lowest level of the Temple were hurriedly covered over when the original builders had to shore up the building as it started to collapse under its own weight. During the C20th restoration these relief panels were systematically uncovered, photographed then recovered. Following the complete restoration of Prambanan and Borobodur (which was then designated a world heritage site) both temples were damaged by another earthquake in 2006 and had to be restored again, work is ongoing and it is a remarkable thing the Indonesians have achieved returning these buildings to the world. On the way back to Yogya we stopped in a small farming village which is part of a tourism co-operative created to bring tourism money into rural communities. We were shown around the village in a horse drawn cart stopping to see ‘home industry’ making crispy snacks from Cassava root, and to try playing traditional gamelan instruments (mixed success) and then through the farmland surrounding the village which is the main source of income for the community. We ended up at a little café where we were served tea and cakes, just as we got there the heavens opened and it poured, fortunately our excursion was over and we returned to the hotel and a final meal in the wonderful restaurant. One amusing feature of our time in and around Yogya was Mark’s sudden popularity! Lots of people visiting the temples were from outside the city and don’t see many western tourists, they were very curious about us and particularly Mark. Several times our guide was approached and asked where we were from and if we would pose for photos, other times we noticed people taking pictures or men would come up and shake Marks hand and take a selfie. One group of school girls plucked up courage to ask for a photo and practised their English with us. I hope it doesn’t go to his head.